Sashti Devi is sixth incarnation of Mother Earth and consert of Lord Murugan (Subrahmanya Swamy). Shashti Devi is daughter of Lord Brahma and also called as Deva Sena. 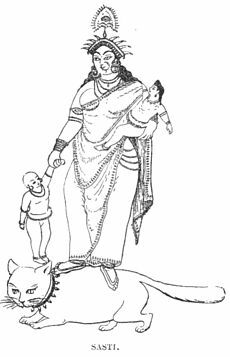 Goddess known as protector of kids and it also believed who worshiped her will be blessed with children. Devotees worships her chanting Sashti devi stotram for longevity of health for their children. Itisbelieved that she alwaysprotect children and assist during childbirth. She is often pictured as a motherly figure, riding a cat and nursing one or more infants. Devotees worship Goddess Sashti Devi on the sixth day (on sashti tithi) of every lunar month of Hindu Calendar. It is believed that the Sashti Devi Stotra should be chanted on this day.